The Swedish government, in continuation of its depraved and inhumane right-wing politics, has detained Mission Free Iran’s representative on asylum issues in Sweden, Navid Mirpourzadeh (read his story). The Swedish government has the intention of illegally deporting him. We knew that they would make this attempt. We also know that they will not succeed. We, hand in hand with rights activists, Navid’s lawyer, and honorable people worldwide will see to it that Navid stays, and is granted his full complement of rights as a recognized refugee in Sweden. Together, we will once again force back the right-wing Swedish government’s hand as it makes a criminal attempt to send yet another activist at risk of torture and execution back to Iran. We have joined hands and done it before, and we will do so again. Count on it. The below post appeared on our affiliate site, World without Borders, written by Ahmad Fatemi. Navid Mirpourzadeh was detained today. It is sad because Navid’s case is so crystal clear that should have been resolved with a positive response earlier. It is sad because the news will torment Navid’s family which has already lost a child, Navid’s brother a labor activist who was executed by the regime of terror and crime. It is sad because it was EXPECTED and this is really SAD. It is really sad because there is a terrorist regime which has murdered 10s of 1000s of human beings in Iran, Europe, the Middle East, Asia and South America to promote one of the most reactionary and barbaric systems of governance, governance under Shari’a law; and there people like Navid who are combating this barbarity and intend to replace it with a free and humane political entity; and there are regimes like Sweden which claim to be democratic, to value human dignity, to care for freedom …and sadly seems to have mobilized an entire bureaucracy, from the paper pushers of the Migration office to the Migration judges, with strict orders to send Iranian political activists back to Islamic persecution….It is sad. Navid stays in Sweden. We promise this to Navid, his family and friends. Navid stays in Sweden. We promise this to the Migration office and minister. Navid stays in Sweden. We promise this because we know the Swedish society and the depth of this beautiful people’s respect for humanity and human rights. Navid stays here. We promise this! Mission Free Iran will launch a political campaign in support of our dear Navid. More information will be released shortly. The author of this article is attacking the people that are most likely to help Navid. It is the so-called right wing that recognizes the threat of Islam. We are after all in large part Christians which makes us a favorite target for Islamists. How about a retraction and an apology? You criticize what you call the “right wing” for opposing the violent criminal nature of Islam and at the same time plead for help to prevent that same violent criminal nature of Islam from claiming one more victim. Are blind? 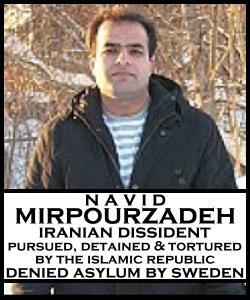 Sorry to be brief but we have yet another deportation from Sweden on our hands now that we have to deal with – another known Iranian activist that Navid ran into when he landed in detention. There are thousands of them in the same predicament. Bottom line is there is in fact a fascist right-wing tide that has been rising in Europe. It is responsible for anti-immigrant pogroms in Greece, it is responsible for racially motivated beatings of defenseless Iranian and other refugees detained on migration charges in Cyprus, it is responsible for the Swedish government’s repeated efforts to send Iranian activists to torture and death in Iran. It’s everywhere you look – it’s empirically observable. If you identify with right-wing politics, maybe you can talk some sense into your brethren across the pond and tell them to bloody well stop sending back to their deaths or interminable detentions the people best equipped to halt the Islamic Republic’s terroristic violence at home and abroad in its tracks. Thanks for reading our work. I am the founder of the American Defense League. I receive your email alerts, follow your page on RSS and frequently publish articles highlighting the plight of Iranians suffering under the evil regime of Islam. Islam has been the direct and immediate cause of the world’s largest and longest running holocaust. I’m a bit hacked-off at you because I can’t publish your article about the plight of Navid because of your bigoted commentary.